Chinese New Year and Valentine's Day Super Sale! Get a pair for you and your special Valentine! Hoodies were never as cool as this! Get yours NOW or regret it later. This hoodie is so cool it sold thousands in a few days. You won't need a reason to buy this, you just have to. Anyone wearing this will definitely attract a lot of attention to himself/herself. HURRY get yours now before the whole hoodie turns white! Excellent quality guaranteed! You will fall in love with it more the first time you touch it. Perfect sublimation all over print quality. It will never fade no matter how many times you wash it. 100% Premium Quality Polyester. Extremely comfortable to wear and lint-proof (di magkakahimulmol). Zipper will never get stuck. Excellent quality double construction zipper. Professionally sewed to endure a lifetime. Available in US Standard Sizes (small, medium and large). 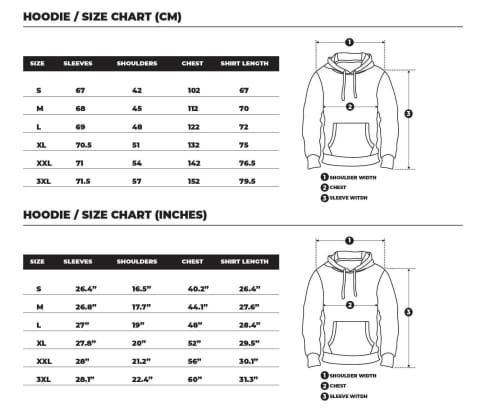 Please check the size chart below before ordering. US Sizes are bigger than Asian Sizes. NOTE: Shipping for hoodies will be 7 - 10 business days. Orders will be queued then printed in order and due to heavy demands it may cause delays on shipping. Check our collections of Hoodies. Click Here! Thanks WGEAsia! Nareceive ko na po. Ito na at gustong gusto ng boyfriend ko. Napakaganda ng Jacket.